We believe that your bike deserves the best treatment and an excellent mechanic. At Coast In Bikes we offer a bicycle mechanic co-working space. Each mechanic is a contractor that rents the space “barbershop style”. Each mechanic has their own set of skills that they bring to the bench & to your bicycle. 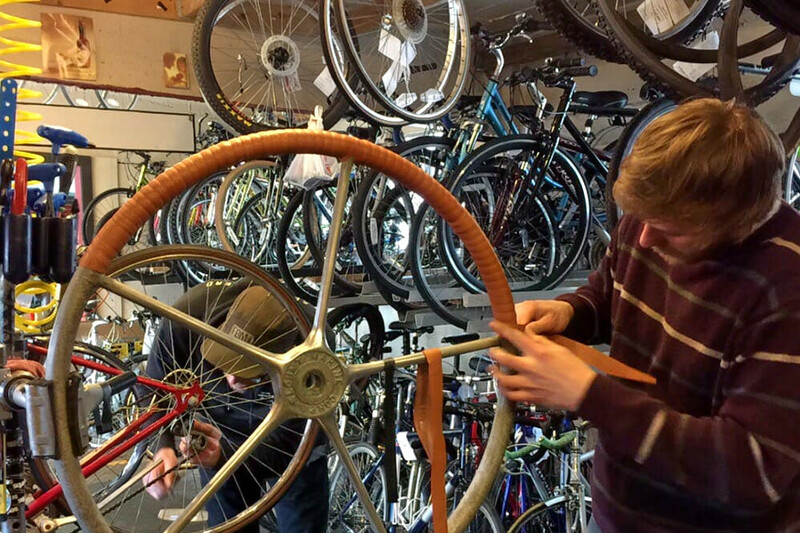 You can schedule directly with an mechanic and set up an appointment or bring your bike by our open shop hours. We have a small selection of retail items for sale and mechanics have access to the parts and accessories needed. Browse below our current mechanics and make an appointment to start give your bike the love it deserves. Interested in renting a bench at Coast In Bikes? Email Carolyn at coastinbikes@gmail.com for more information and to connect. Click here for more information. Tristan has over sixteen years of bike mechanic experience in several shops in Door County and Milwaukee. He specializes in mountain bike, off-road bikes, touring, custom builds and general bike work. Carolyn has been working in bike shops and community bike spaces for eight years. and is the owner of Coast In Bikes. She has her mechanic certification from UBI and specializes in cargo bikes, electric bikes and everything in between. Jared has over sixteen years experience wrenching on bikes in Wisconsin. He's a down-to-earth mechanic who has been the service manager and mechanic at Bike Fixers (formally Cory the Bike Fixers) for the last twelve years. You'll find working on all types of bikes, custom bike builds and designing out a customer’s latest touring rig. Want to schedule your bike work with Jared? He's taking appointments s for winter tune-ups, custom builds, general service work and all your bike needs.